The Warriors of Sunlight are the followers of the firstborn of the Great Lord Gwyn. They harness the power of sunlight, manifested as lightning powers. This covenant is mostly for co-op purposes, with an additional focus on attack Miracles (contrast the Princess's Guard). Joining this covenant allows the player to be summoned as a Gold Phantom for cooperative play. Joining and ranking up will give the player access to several offensive miracles. Higher priority matchmaking on the network also facilitates a higher success rate of co-op summons. 25 Faith is required for joining. The requirement, however, can be lowered by 5 for each area boss cleared while being summoned as a white phantom. For example, if 4 bosses are defeated as white phantom, only 5 Faith will be the new requirement (25 - (4x5)) to join the Warrior of Sunlight. Pray at the Altar of Sunlight, which is located next to the bonfire below the Hellkite Dragon in the Undead Parish. The Sunlight Spear requires current membership of the Warrior of Sunlight covenant to be used. The Lightning Spear and Great Lightning Spear miracles can still be used after leaving the covenant. 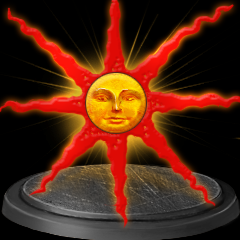 The Sunlight Spear is available to most players only in NG+ because it requires the last boss's soul. However, it is possible to obtain before NG+ if the soul was gifted by another player online.